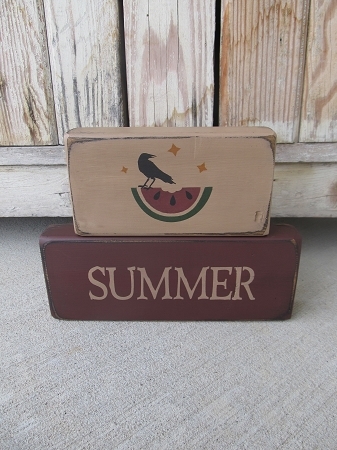 Primitive Watermelon and Crow Summer Set of 2 Hand Painted Stacker Blocks. Love this new item for summer!! I'm offering this set with some color options for the bottom block. Couldn't pick a favorite...all look good. Choice of Black which is shown or Burgundy. 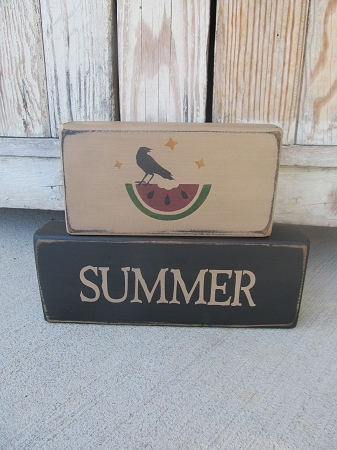 The bottom block has been painted and distressed with the word SUMMER in khaki tan. The top block is Khaki Tan with a watermelon in Burgundy and Crow and a few Mustard color stars above. Size is 9" x 2" and 6 1/2" x 2. Size stacked up is 7" high. Each is distressed the stained for a primitive look. Hand painted, designed and signed by Heidi.